After a while you will inevitably open a paint only to find it is going really thick and hard to use. Alternatively, you may find one particular colour is always really thin and needs loads of stirring just to make it useable. There is a great tip that I use for mixing those paints up without shoving in a stick and wasting lots of the precious commodity. 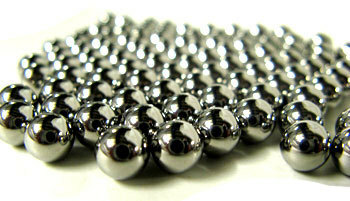 Use ball bearings or glass beads (6mm to 8mm). I drop two of these into every paint I use. For Vallejo pots you will need to pull the dropper top off with a pair of pliers first. They come out and go back in fairly easiliy. The beads/ball bearings will act like the balls in an aerosol rattle can. With the lid on tight, shake the paint pot vigorously and the beads will mix the paint inside with no waste. For old paints that are going a bit thick, add some acrylic flow improver or similar thinners (even water will do it) and then shake the mix to thin it out. (UPDATE) I originally thought ball bearings may rust and dis-colour the paint. However, I have now tried 8mm steel ball bearings and have had no problems. In fact, they work even better than beads due to their extra weight. 8mm is about the max size you could get down the neck of a Vallejo bottle. Ebay is a good resource to get them. Stone beads like Hematite beads apparently work well. Real tightwads can even raid their partners jewellery box, I am sure pearls would be ideal! This is what I use now. Basically any ball or bead up to 8mm max diameter is worth a try but steel ball bearings are nice and heavy and do a good job.